Visible Ink Press : This somewhat unpopular superhero sports a bizarre red furry collar on his costume. This somewhat unpopular superhero sports a bizarre red furry collar on his costume. 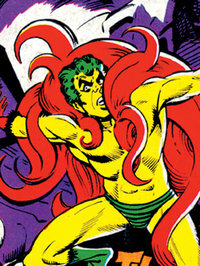 He debuted in 1968, a creation of Steve Ditko. His superpowers are strength and instant healing abilities. More recently he became a resident of Gotham City. His main nemesis is Proteus. When Steve Ditko left Marvel Comics after a disagreement about the direction of his co-creation, Spider-Man, there was no shortage of publishers queuing up to hire him. In the next couple of years, he produced strips for Dell, A.C.G. Tower (Thunder Agents), Warren, Charlton (where he worked on the Blue Beetle and Captain Atom) and, finally, in 1968, DC Comics. At DC he was given the freedom to create and write new superheroes, and he quickly dreamed up the Hawk and the Dove and the Creeper. From a twenty-first-century perspective, the Creeper appears in many ways to be just a variation on the sort of story that had made Spider-Man so successful, but at the time it was probably just a little too strange for most comics fans. The first appearance of the Creeper was in Showcase #73 (April 1968), where readers are introduced to manic TV interviewer Jack Ryder, just as he is sacked for haranguing a guest. Newly recruited as a network security agent (a sort of cross between an FBI operative and a TV reporter that probably only existed in the mind of Steve Ditko), Ryder embarks on his first mission--tracking down brilliant scientist Professor Yatz and rescuing him from the clutches of "evil commies." For some reason, these commies throw a fancy dress party, which Ryder crashes wearing an absurd green-and-yellow costume, topped off with a voluminous, red fur collar. Ryder succeeds in finding the Professor, who gives him an instant-healing serum (which also endows him with terrific strength) and a molecular rearranger before (inevitably) being mowed down in a hail of bullets--life for a brilliant scientist tends to be perilous in comics. In his everyday, civilian identity, Ryder was a rather dogmatic, straightlaced person, but in his Creeper guise he became reckless and demented, often terrifying criminals with his maniacal laughter and mad behavior. Consequently, he was as distrusted by a baffled police force as he was by the hordes of the underworld--much as Spider-Man had been, of course. Most of the time, the Creeper was found battling Proteus, an identity-changing criminal with a blank face (like the Spider-Man villain, the Chameleon), but he was also pitted against the likes of the Firefly and the wonderfully christened Yogi Bizerk. Undoubtedly, the comic's major selling points were Ditko's energetic pacing and dynamic drawing, which were the equal of anything on the stands at the time. On the other hand, Ditko's characters appeared to inhabit a strange, timeless world in which people wore berets, Stetsons, or polka-dotted clothes that owed nothing to late 1960s America as his readers knew it. Following its introduction in Showcase, the strip went on to six issues of its own title, but then it was to be several years before the Creeper was heard from again. The mid-1970s saw a rash of new Creeper stories in various Batman comics, which revealed that the Creeper had moved to Gotham City. Ditko himself returned to the Creeper for a one-shot in 1975, which was followed a few years later by a longer run in the pages of World's Finest Comics. As is often the case, the 1980s and 1990s saw occasional short stories (as a backup in The Flash, for instance) and guest appearances culminating in a very eccentric 1990s series. In 2003 a radical reinvention was released, inspiring a new generation of fans. The new comic is set in the art world of Paris in 1925, and features a mysterious female Creeper who is as much cat burglar as superhero. Ditko's original Creeper continues to appear in DC Comics, including starring in his own 2006-2007 miniseries and serving a stint as a member of the Outsiders. The Creeper was featured in a 1998 episode of the animated series The New Batman Adventures titled "Beware the Creeper!" and made cameo appearances in several episodes of the animated series Justice League Unlimited.